In February 2018, KAICIID organized a global con- ference which brought together leading representatives from numerous religious communities to support peaceful coexistence. At the conference, the Centre launched an historic interreligious platform supported by Christian and Muslim leaders to advocate for the rights and inclusion of all communities in the Arab world. The Platform is the first interreligious dialogue platform of its kind. Planned activities of the platform include training clergy of all religions to combat hate speech, implementing initiatives which empower youth and women, and working with local and national authorities on policy which promotes social cohesion and equal rights. In an unprecedented demonstration of multi-religious solidarity, leaders of Christian, Muslim and other religious communities from Iraq, Syria and the larger Middle East region meeting at the KAICIID Conference "United Against Violence in the Name of Religion" on 19 November 2014 denounced with one voice all violence in the name of religion, and have called on the international community to protect religious and cultural diversity in Iraq and Syria. 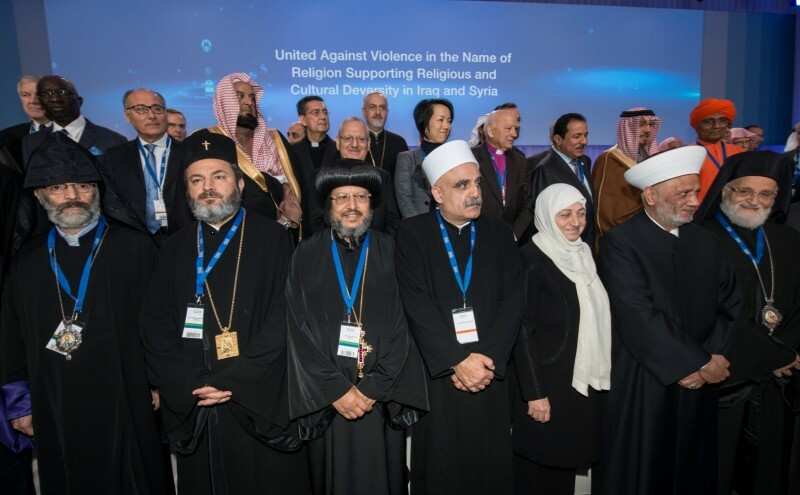 Religious leaders from Sunni, Shiite, Christian, Mandean, and Yazidi communities across the Middle East jointly issued the Vienna Declaration, "United against Violence in the Name of Religion", at the international conference organized by the KAICIID Dialogue Centre. This is the first time religious leaders representing so many different religions from a crisis region have come together as one to denounce oppression, marginalization, persecution and killing of people in the name of religion. High level Christian and Muslim religious leaders from the Middle East met in Athens on 3 September 2015 and endorsed the “Athens Declaration: United Against Violence in the Name of Religion - Supporting the Citizenship Rights of Christians, Muslims and Other Religious and Ethnic Groups in the Middle East”. "United against Violence in the Name of Religion" conference: This conference, held in November 2014 in Vienna was focused on the critical situation in Iraq and Syria. It resulted in the adoption of a plan of action and inaugurated the official launch of the initiative "United against Violence in the Name of Religion", which includes several activities and projects aiming to support peaceful coexistence by focusing on four areas: 1. social media, 2. religious education, 3. reconciliation and social cohesion, and 4. strengthening institutional capacities in interreligious dialogue. In addition, at the close of the conference, attendees issued “The Vienna Declaration”, a joint statement formalizing their commitment to promote dialogue and mutual respect. Social Media as Space for Dialogue trainings: As part of the UVNR initiative, KAICIID implemented a training program: “United against Violence in the Name of Religion: Social Media as a Space for Dialogue” which gathered more than 200 leading young religious leaders and representatives from different religions in the Arab world, representing the various religious communities that make up the social and religious fabric of the region. This program has continued through the implementation of various local initiatives (social media campaigns) in the Mashreq, and Gulf regions, as well as an initiative with UNDP in the Maghreb. Dialogue and Interreligious Education: A “Network of Religious and Theological Institutions” in the Arab region was also established, while the centre still organizes consultative meetings with religious leaders to launch a platform for activists and peacemakers in the region. In addition, in late 2014, the Center launched the International Fellows Programme, which aims to train teachers and educational institutions from different religions (Buddhist, Christian, Hindu, Jewish and Muslim) to prepare students and tomorrow’s religious leaders to be builders of peace and leaders in the field of interreligious dialogue. Reconciliation and Social Cohesion: Beyond its efforts in Iraq and Syria in this area, in the past five years, the Centre and its partners such as the Network of Religious and Traditional Peacemakers, the International Mediation Center and UNDP have worked on the development and implementation of programmes in each of KAICIID’s focus countries (the Central African Republic, Nigeria, and Myanmar), in order to support peacebuilding in areas where conflict is spreading and to help communities develop their skills and use dialogue as a tool to reach mutual understanding and to enhance social cohesion.